Discussion in 'WIP (Work in Progress)' started by luxatile, Nov 1, 2008. 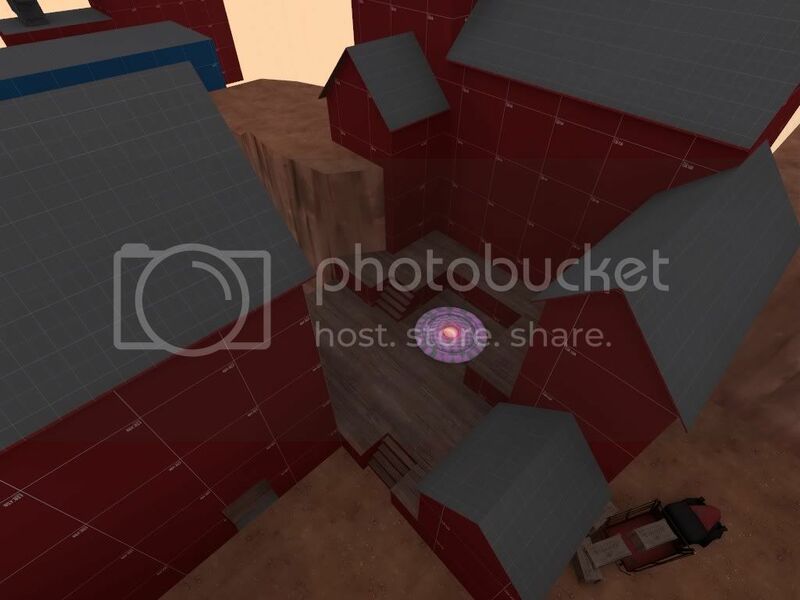 Taking place in an abandoned desert-y place, the goal of cp_vulture is simple: BLU must push RED back through the map, all the way to the end, by capturing a total of six Control Points spread across three different stages, while RED must do their best to defend their territory from BLU. 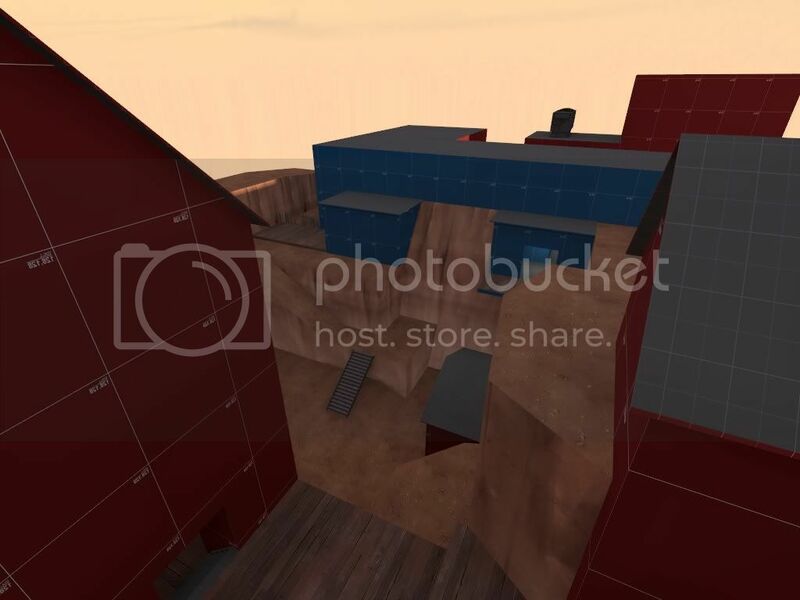 In this thread I'll be posting updates and screenshots from my upcoming map, cp_vulture. I'll make regular updates, but for more in-depth info, check out my blog. Link at the bottom of the post and in my signature. Image notes: Those screens with the ambulance show BLU's spawn, which is, indeed, outdoors. Kinda inspired by the backyard near B in Badwater. Image notes: Early screenshot of stage 2. More to come! Image notes: In-depth info can be found further down page 1. Image notes: Lighting improved. Screens 5--> are of stage 3, which is now finished. See page 3 for in-depth info. Image notes: Showing some new areas. Image notes: Redesigned 1-1, cut down a chokepoint by 2-1 and rearranged 2-2 a bit. 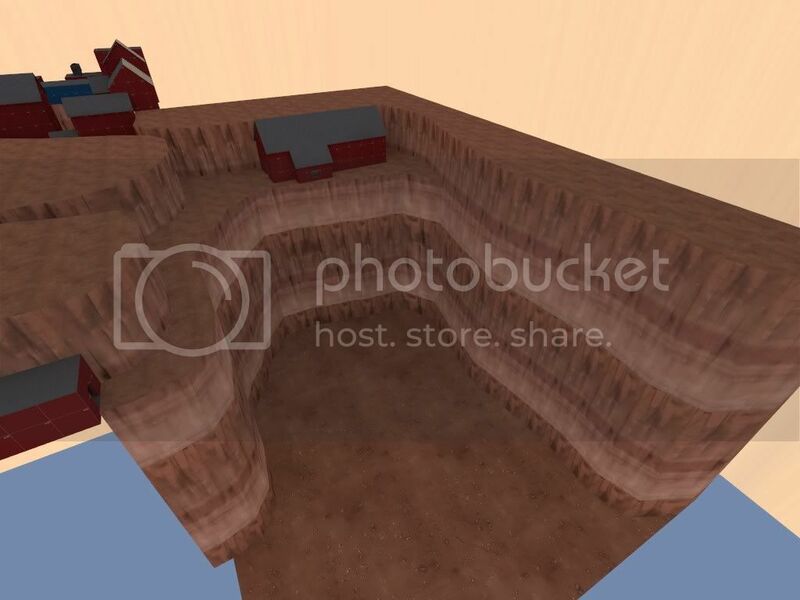 Image notes: My first cliff displacements! Image notes: New spawn details! Image notes: The first image shows an improved 1-2, with an additional sentry spot and a new route, primarily to give RED more height. The second and third images show some details by the start of stage 2, which I made just for the hell of it. Smaller announcement and in-depth info can be found in my blog! Looks like a great start. You might want to rescale the tire track overlay to match the wheelbase of the ambulance though. The first cap seems a little exposed, if you look at dustbowl's first caps, they all have plenty of cover and don't have line-of-sight from BLU's base. Right now it just looks like RED has little chance to defending it. Yes, you're right about that. I should've mentioned that I'm planning to add cover to that bridge (masked as a ticket sale shack, which goes well with the fact that a train track runs through the entire map). 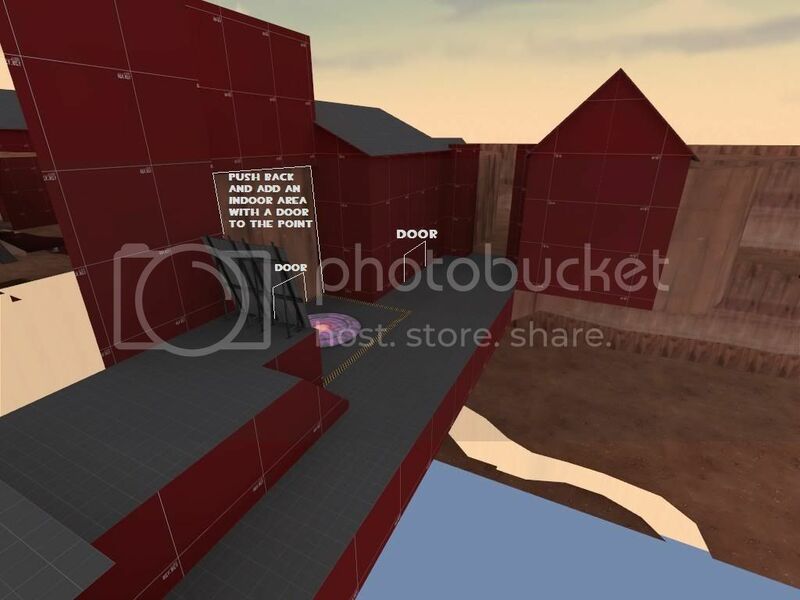 I should also mention that RED can establish a defense inside BLU's building - the only places where BLU is safe is in the outdoor spawn, as well as the room inside the door second from the left in this picture. We'll see how the balancing goes after some testing. Not a lot of new stuff to show off - but here's a single new screenshot to keep you interested. Shows the first part of the second stage. It's too wide right now, so I'm going to narrow it down a lot. I've completed a lot of stage 2 now. Only the final area remains! That's two down, one more to go + essential entity work, and I can finally get this tested. The first cap, seen from BLU's start area. The main entrances to the point are the path to the right and the entrance below, while Soldiers and Demos can also get up via the small cliff. The same area, seen from the cap. BLU can exit from the two small shacks. I might add another exit of some kind. A close-up of the first point. Overview of the first area. Don't let the size scare you - all the tall cliffs are inaccessble. The main play area right here is in the house and on the narrow ledge. What you see to the left is the beginning of a "safe path" as I like to call it - a place where BLU can build up ubers, guarded by a one-way door. The last cap of stage 2, which is kind of uninspired right now. I have plans for it, but it might change a lot. Looks good. I'd say those roof things sticking out doesnt fit the architecture (I'll have to see ), but I agree on the lighting. It seems like everything is in constant shadow. Why? Don't worry about it, anything that looks boring now certainly won't later on. You might be right about that. I haven't really thought about it yet, but there's a good chance the architecture will be changed to an overall Badwater-ish look with concrete buildings or something. Some of these buildings may look like farms right now, but obviously detailing has far from started. Also, I hate those buildings that look like they're halfway inside a cliff. I have lots to change. Notoorjus: Yeah, I know about the shadows. I have no idea, but shouldn't pitching the sun up fix this? I'll try and see. I think he means point the sun downwards as everything has an equal blend of shadow. That red building on the right seems huge. I'll wait for some more stuff before critting it properly. About the sun...I'm convinced we're still talking about the same thing. Either way, that is going to be fixed when I have reason to care about it. This point seems to be very linear at the moment. I'm assuming Blue is attacking from the far end, and Red as defending from the close end? Either way, there's only one route of access, and that barricade on top of the point is really limiting the defenders (or even the attackers, if I have my directions messed up). I've included one idea for improvement. 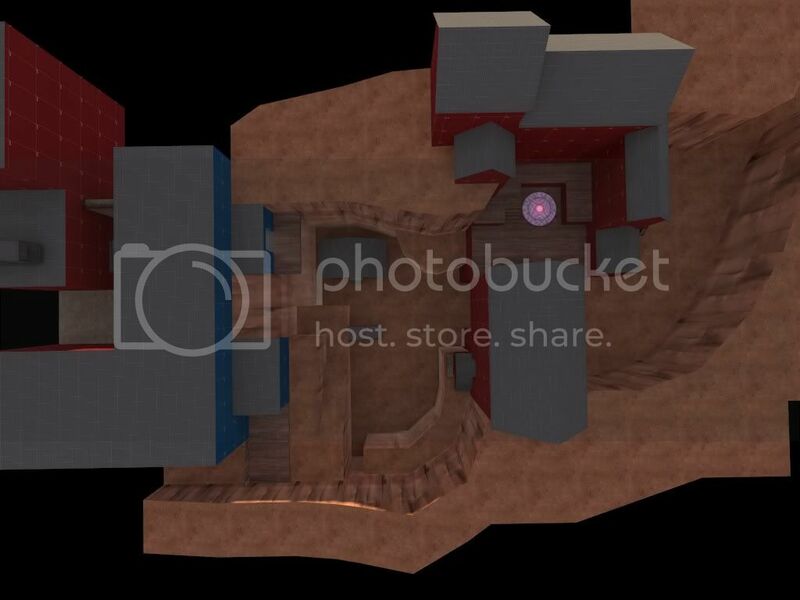 Add an interior area in that wall/cliff that opens up to the point for 2 ways to access it. Now that I think about it, you could even add a 2nd level and some windows for more ways of attacking/defending. Hey, thanks for that, I was really stumped. I was planning to expand it a bit where there currently is literally nothing (opposite of you suggested doors), so it won't be completely linear either way. The second point is now finished, and it looks like this. That upper area is kind of like the Badwater roof - both teams can easily access it, and if BLU manages to control it, they can very easily make the cap. The area directly opposite of the cap point. The only new things here are the signs and the tunnel entrance. The tunnel is the typical area with a one-way door, designed as a safe zone for BLU. ...And my full overview of the cap area appears to be gone for some reason. I guess I didn't press F5 hard enough. I guess there's a hint of sun light, yes. I should mention that I haven't played with the lighting yet. 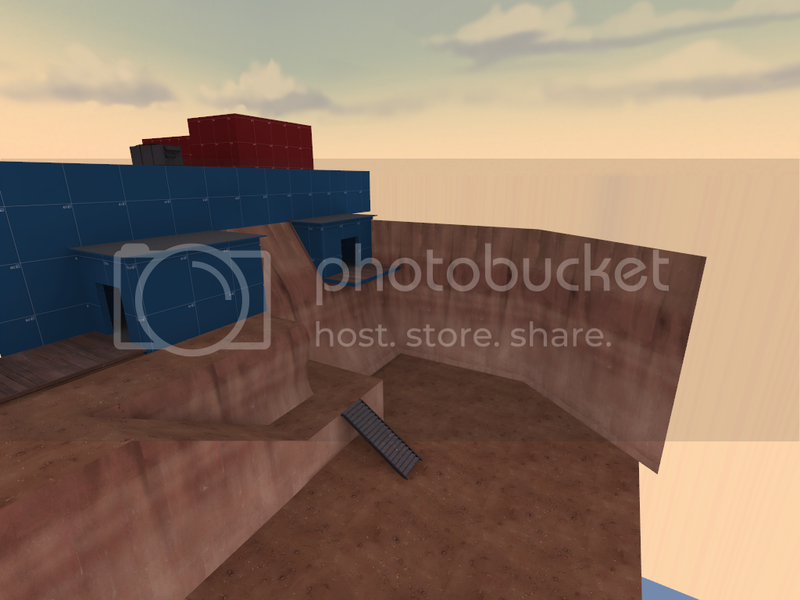 However, I want to change it to the Hydro lighting and sky first, since I want to have a similar style to that map. 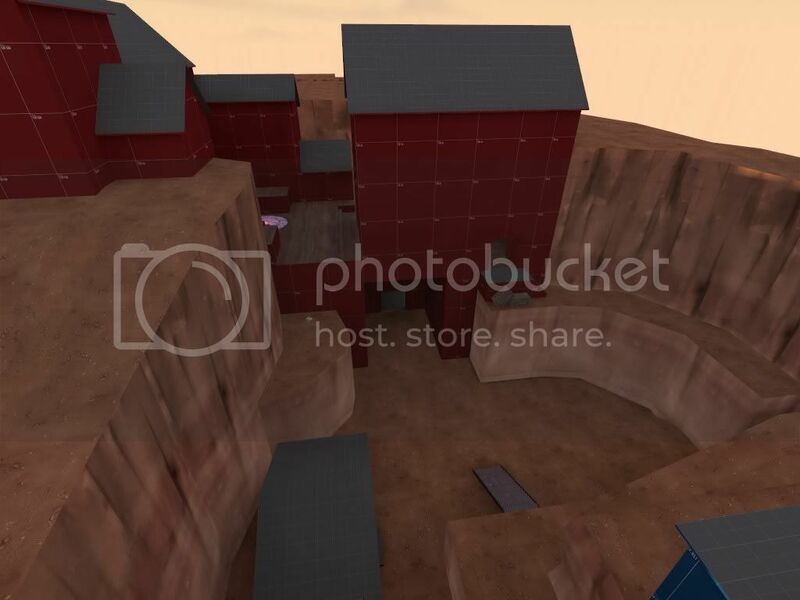 In my opinion, that's the best looking Valve map. EDIT: Oh, and I'd love some suggestions for a better name. I'm not too fond of Vulture's current name, as it isn't very descriptive. I think he means the skybox, it looks like rays of light coming from under the map like an old cartoon. What's the theme of your map? Normally that would dictate your name. Perhaps an extraction project, refinary? Outpost? Once you start theming your buildings and giving them purpose, then you'll probably have a better idea for a more appropriate name. Relavent to what your buildings represent. I think vulture is a great name. Grazrs vulture model idea is cool!